If Alboraya, Valencia, is known for anything, it is for being the land of horchata and yellow nutsedge. In this “House in the garden” home, created by the Ramon Esteve studio there are urban boundaries, allowing an impressive terrace-viewpoint to be enjoyed, with extensive views of the yellow nutsedge groves. The 665m2 single family building has a ventilated facade made with the solid surface KRION. For its installation, the Ramon Esteve studio was advised by Butech, the PORCELANOSA Group company dedicated to technical solutions. 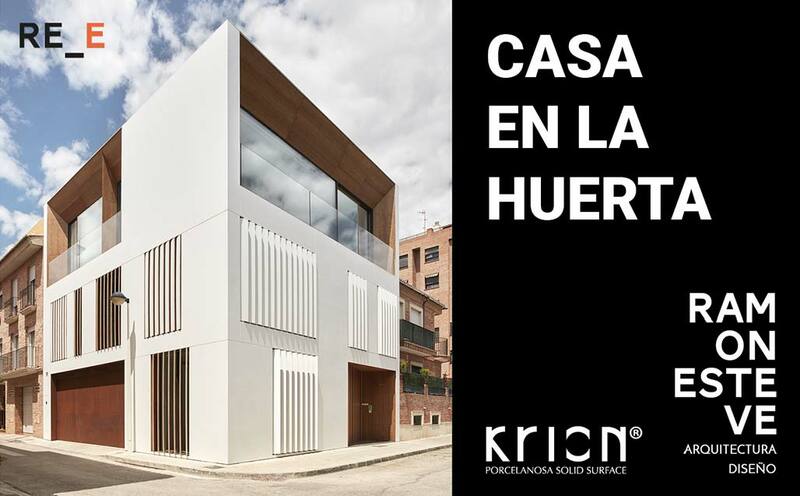 The Ramon Esteve studio, experts on the KRION Lux material, designed a clean, white, abstract geometric enclosure, combining large white panels of KRION 1100 Snow White, forming the facade which reinterprets the segmentation of the garden. In the two large facades forming the home, there are perforations generating the openings of the house, made from iroko wood, marking access to the accessible areas. We can also find KRION Lux inside the home, transformed into a kitchen countertop, a pure white element which is perfectly combined with the wood and the rest of the rooms that Ramon Esteve, his studio and collaborators Estefanía Perez, Anna Boscá, Víctor Ruiz, María Martí, María Parra, Tudi Soriano, Isabel Meyer and Emilio Pérez, among others, were able to materialise in this “House in the garden”.